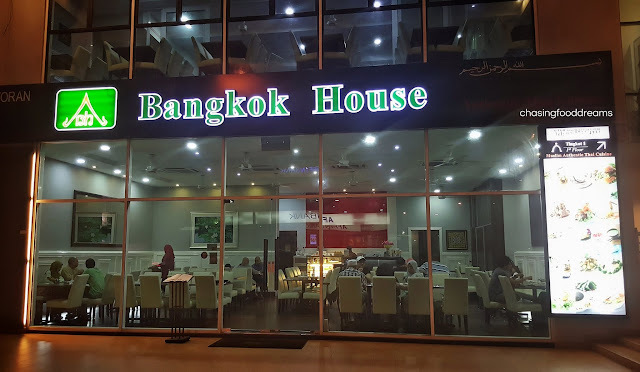 Nestled in the heavily populated area of Taman Tun Dr. Ismail is Bangkok House Thai Restaurant, whose owners have been serving authentic Thai cuisine for more than a decade in their previous restaurant in the city area. Bangkok House opened officially in January in 2015 at TTDI and has been serving affordable Thai dishes to many. The restaurant is set in a pristine white ambiance to give the restaurant a modern and elegant mood. Run by the owners’ family, the kitchen is helmed by one of the owners too. As everything is prepared to order and it’s a small family run business, there will be some waiting time for the food. It’s worth the wait so just sit back, relax and enjoy the robust flavours of authentic Thai food at Bangkok House. 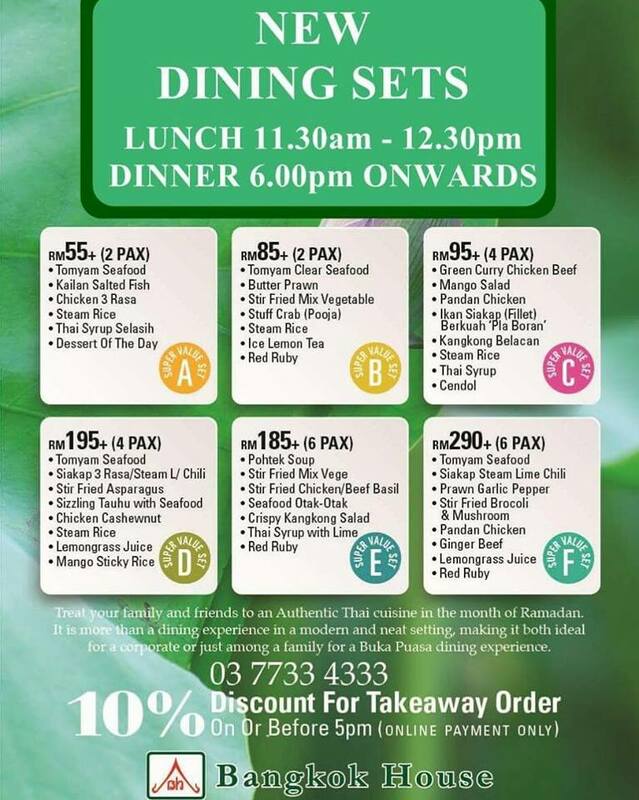 For this holy month, Bangkok House is offering Ramadhan Dining Set Menus from 2 pax to 6 pax. Prices starts from RM55+ onwards. Simply value for money, the dining sets are available for lunch and dinner. The set menu includes main courses with rice, dessert and beverages. We tried their Ramadhan Dining Set Menu for 2 Pax (RM85), consisting of 3 main dishes, a soup, 2 steamed rice, 2 desserts and 2 Ice Lemon Tea. First up, a Stuffed Crab (Pooja) filled with minced chicken, crab and vegetables before being coated in egg and fried. Looks deceptively simple but it requires a lot of effort to make this dish. The stuffed crab has a moist and tasty filling and goes well with the Thai sweet chili sauce on the side. Tomyam Seafood was next. The restaurant has the clear or red version. Our fiery red version had all the checkmarks of an explosive flavourful tomyam. Laced with lots of fiery heat from chili and creamy notes, the soup was superbly sour but well-balanced with savory and sweet flavours too. There were prawns, crab and squid in the dish together with mushrooms. Thumbs up for this awesome tomyam soup! Not the usual but nevertheless delicious, the Butter Prawns had succulent prawns sitting on a bed of buttery crisp egg floss with lots of curry leaves in aromatic cream sauce. The dish goes will on its own or with rice. I really enjoy the pale crisp egg floss a lot with the bouncy prawns. For veggies, there is the Stir Fry Mix Vegetable. Simple stir fry assorted vegetables and mushrooms in standard brown gravy and topped with lots of golden garlic bits. The set finishes with two bowls of classic Thai dessert of Red Ruby. Icy sweet, creamy and great to end the meal with. Bangkok House is also having a Food Street Galore showcasing some Thai street food dishes. We tried their signature Spicy Thai Laksa with Green Curry or Yellow Curry or Kanom Jeen Kiewan (RM18). Once can opt for Chicken or Prawn for the Green Curry. The thin noodles has a good chewy bite and goes well with both curries. The Green Curry with Chicken is very tasty with all the right balance of spices, herbs and heat. There’s plenty of tender chicken slices with eggplant and long beans as well as the baby Thai eggplants. Diners can add their own herbs and vegetables with the noodles to the curry too. The yellow curry is made with ground fish flakes and tasted a bit more pungent than the green curry. I also like the addition of pickled mustard vegetable that really gave the curry noodle a good dose of tangy bites. Another dish worthy of an order would have to be the Somtam with Grilled Chicken (RM27). We enjoyed the tangy and pungent papaya salad as well as its crunchy texture. The side of Kai Yang or grilled chicken goes perfectly with the papaya salad. Using the thigh cut, the chicken is very flavourful and moist as well as tender. The savory sweetness in the chicken balanced up the tangy salty and spicy notes of the salad. Fried Beef Ball (RM15 – 4 sticks) is a street food favorite and this one was decent but nothing to shout about. We were curious about the flavours of Ikan Siakap Berkuah ‘Pla Boh-Ran’ (market price). When the dish came, we were certainly pleased with what we saw. A whole siakap was fried till crispy and smothered in a fiery red looking sauce topped with aromatics of curry leaves, onions and cashew nuts. The sauce has an intense flavour of savory and sweet note. Not spicy at all, the flavours definitely beckons for steamed rice. If I have to rave about one dish at Bangkok House, it would certainly be their Coconut Ice Cream. Gosh, the Coconut Ice Cream with Corn, Peanut, Kabung, Nangka, Keladi, Potato, Red Ruby & Cendol (RM17.50) was simply heavenly. The coconut ice cream is utterly luscious, creamy and salty. Smooth and so velvety, we just couldn’t stop digging into this icy heavenly dessert. If you prefer less condiments, there is also the Coconut Ice Cream with Corn & Peanut (RM6.50). A Must-Order!! Bangkok House is also having a special Thai Takeaway Express that is perfect for berbuka puasa or bersahur. Choose from their range of curries and soups available at only RM10 a box. These need preorder so call to ask for the choices available and to preorder them for pick up.